Everything Coastal....: Scallop Skillet inspired by Chef Staffan Terje and Coastal Living Magazine! 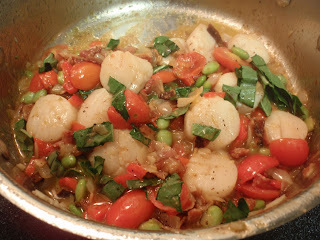 Scallop Skillet inspired by Chef Staffan Terje and Coastal Living Magazine! So... since I have had all of this time (ha ha ha) to be creative, I am teaching myself to cook all over again. And, you all will be happy to know that I am not half bad at it either! Step one: Rip the recipe out of the magazine and head over to the local Safeway seafood counter for some advice. P.S. this recipe serves 8, I cut it in half for just us. Still too much food, but I didn't want to ruin anything by trying to cut it even more. Here's my best advice - follow the recipe exactly. Especially when cooking the scallops, they can easily be overcooked and become little rubber balls if you are not careful. I don't recommend a non-stick pan, it doesn't seem to work right. Also, have everything chopped, diced, measured and within reach so that you don't accidentally overcook any of this delish dish. 1. Cook bacon in a large skillet over medium-high heat until crisp, remove bacon, and drain on paper towels, reserving the drippings in the pan. Crumble bacon and set aside. 2. Sprinkle scallops with salt and pepper. Heat bacon drippings over medium heat until hot. Add scallops, 3 minutes on each side, then remove from the pan. 3. Add butter to the pan. Add onion and garlic, saute', stirring often, 2 minutes. Stir in bell pepper and edamame; cook 2 minutes or until crisp-tender, Add wine, and cook 30 seconds, stirring to loosen particles from bottom of skillet. Add bacon, salt, pepper and the grape tomatoes; cook stirring constantly for 5 minutes or until tomatoes soften. 4. Return scallops to the pan; cook 1 minute or until thoroughly heated. Remove from heat and stir in the fresh basil. New on the site today! More food safe recycled glass - I love these small scallop bowls for collecting treasures too! Thanks again for stopping by - have a great week and I will see you soon at the beach! Sometimes I think the recipes are best part of the magazine but being southern, I would have to include the GRITS! Love the scallop plates. By chance did you see the beautiful dishes with a sea theme that Kohl's sold last year? They were gorgeous and I managed to get a service for 8 for less than $100 with free shipping (they had a big sale)! P&H - So glad you liked the recipe, and the "scallop" designs! Erin - Do you have a favorite way to cook scallops? I am new at them, and am just learning. JoJo - I promise to try grits next time... and I did miss the dinnerware at Kohl's last year - would love to see your photos! Oh, I'm definitely in the mood to try out new stuff, usually I just put the scallops on the grill..., and I'm a bit challenge when it comes to following a recipe exactly, I think I've never done that, haha. I know what you mean about following the recipes... 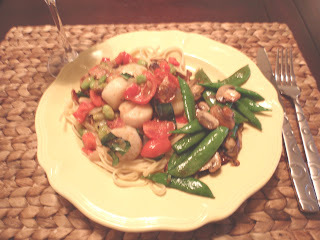 I only did it in this case because I was so nervous about messing up the scallops! Have a great day! Hi Caron! Thanks for stopping by my blog and leaving your wonderful comments. That recipe is great. 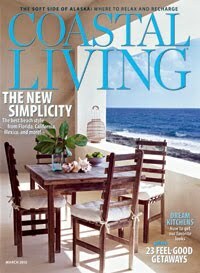 I am "partial" to that particular issue of Coastal Living, in general. Ha! Patti -So happy to have made our connection, and am so excited for you to be featured in the March Issue of Coastal Living! Very nice article all about you and your fabulous creations! I do like Scallops but have never cooked them myself but am going to follow these recipes! Great scallop shaped dishes etc too - loved this post.